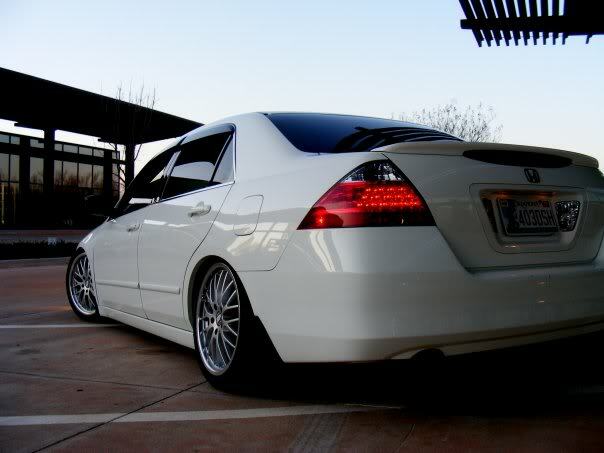 Accords have really be coming into their own lately among the stance crowd. A car which was historically seen as the older, more conservative brother of the Civic is finally starting to get the respect it deserves as a platform, that in the right hands, can hang with the best of them. 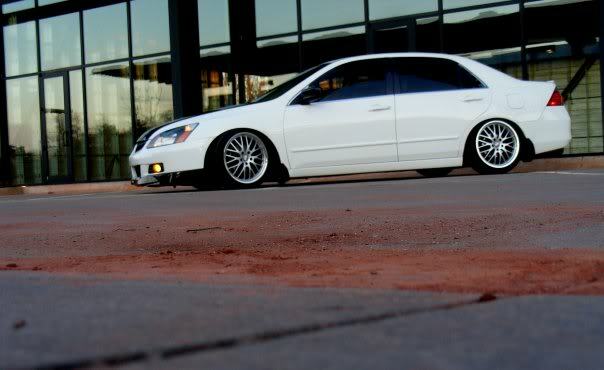 Hailing from Oklahoma City, Oklahoma Malik bought his Accord brand new in 2007 as a way to escape the lure of the street racing scene and has been transforming it into a head turner ever since. Soon after purchase Malik started his modifications off fairly conservatively by upgrading the headlights and fog lights by retro fitting HID units and before he knew it the mod bug was fully taking over. In his hunt for the perfect stance Malik went through a variety of different suspension setups initially the car was lowered on Tien S-techs, then Eibach Sportlines, and finally Nuespeed race springs. When none of these options delivered the slam Malik needed he picked up a set of Function Form coil overs and dropped his Accord on its knees. With his suspension finally in order Malik flew through 14 different sets of wheels before landing on the 18×8 TSW Snetterton wheels currently taking residence in his wheel. However these wheels are only there until a set of flush fitting CCW Classics takes their place. In preparation for the stunning forthcoming wheel set Malik has added a trio of Siebon Carbon fiber accessories including a hood, mirror covers and B pillars. Once this car is flush watch out. By the end of the summer Malik is hoping to wrap up the exterior mods by adding a carbon fiber trunk to the mix, once that happens his attention will turn to the interior where the current stock seats will be replaced with Bride units. So far Malik is off to a great start with his Accord and with what he has in store for his ride it’s only going to get better, I hope once it’s all done Malik will send new pictures in and give me another opportunity to showcase his ride. Previous articleThe store is now live! Hey dude I love your whip so far! Ive been looking for some Nice Window Visors like yours and the Lip Kit, can you help me out and tell me what brand names they are of each? What size tires and what is the offset of rims on rear?